Forums, registration forms and other forms can usually be protected from spammers using CAPTCHA codes or other security extensions such as the excellent EasyCalcCheck PLUS. At least one of my clients is affected and a better solution is required. 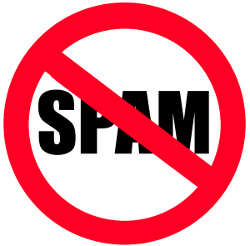 There are several services on the web such as projecthoneypot.org and stopforumspam.com that maintain lists of the IP addresses of known spammers and hackers. We can team these services up with a suitable Joomla extension to stop the spammers from accessing the website at all. I have chosen Akeeba Admin Tools Professional as my preferred solution. An Admin Tools Professional subscription at €20 is excellent value for money and has many other useful features apart from the IP Address blocking. Known hackers and spammers will now be blocked from accessing your Joomla website. You can find more free and commercial IP address blocking extensions in the Site Protection and Spam Protection categories in the Joomla Extensions Directory. HTTPBL - Project Honeypot Blocklists Plugin which checks against projecthoneypot.org. SpambotCheck which checks against several databases, such as projecthoneypot.org, sorbs.net, spambusted.com, stopforumspam.com and spamcop.net. What are you using to foil spammers? Backing up a Joomla website is so easy, there are no excuses to defer this important task. The undisputed backup tool of choice for Joomla is Akeeba Backup. It is very simple to download, install and run Akeeba Backup which backs up all your files and the database into one neat compressed file. This should then be copied via FTP to your local machine or somewhere else safe. The answer to this question is usually, "how much can I afford to lose?". A static website which rarely changes may only need to be backed up once every few months. A website with a few content updates each month might need to be backed up every month. A busy e-commerce website may need to be backed up every day. The free version of Akeeba Backup does an efficient job with the paid version of Akeeba Backup having a few extra features such as the ability to back up to DropBox and elsewhere in the cloud. See the feature comparison for more details. I was recently asked to investigate a hacked Joomla 1.5 website (not one that I built or looked after, I hasten to add). The best way to recover from a hacked website is to start with a known clean copy of the website. Unfortunately, the client did not have his own backup so we had to rely on the web hosting company. After many support emails and a few weeks, it became apparent that the web hosting company had no suitable backup. The only alternative, apart from rebuilding the website from scratch, was to identify and remove all the malicious code. With over 15.000 files in this particular website, it was like looking for a needle in a haystack! Eventually, malicious code was removed from three files and a malicious file was removed to restore the website. This is not the preferred way to restore a hacked website as you can never be 100% confident that you have removed all the malicious code. This method is also more time consuming and costly! When did you last back up your website? * Pay 12 months in advance and get 2 months free. Note: The database tables must be copied across to Joomla 2.5 before installing Remository on Joomla 2.5 as the installation procedure will add new database fields if required. If you do this in the wrong order, the fields won't be created. Install Joomla 2.5 in new sub folder. Migrate core functions including user accounts with SP Upgrade or similar. Upgrade Remository on Joomla 1.5 to latest version, if it isn't already. Note: You need to uninstall the old version and then install the new version. Since version 3.40, data and configuration are not lost across an upgrade. Import the Joomla 1.5 Remository database tables into Joomla 2.5. If the tables are too big for export/import, and they are on the same server, you may be able to use the copy table operation instead of import/export. Install the latest Remository version on Joomla 2.5. The database tables are automatically modified with extra fields, if needed. Check for and copy any files in the file system. Locations will be specified as absolute paths in the configuration. If paths in the site have changed, you may need to update the configuration. 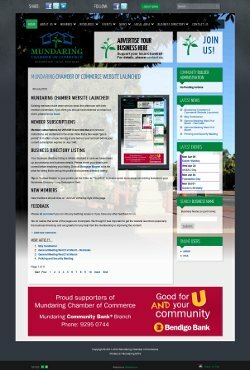 The latest website created by Webilicious ® is for the Mundaring Chamber of Commerce. The Chamber officially came into existence in August 2011, taking over from The Eastern Hills Business Association and aims to support and promote local businesses in the Mundaring Shire and surrounding area. As usual, it was a case of finding out about best practice with this type of website and being inspired by existing Chamber websites. The main challenge with this particular job was working out how to marry a subscription system and a business directory as there did not appear to be any "off-the-shelf" Joomla Chamber of Commerce or similar extension available. The PHP code includes a check of the CBSubs subscription status and also checks a "List in Business Directory" = Yes/No Community Builder field so that listings are only shown if members have an active subscription and if they enable the option in their profile. All the usual CBSubs subscription features are available. In this particular case, memberships are configured to match the financial year with the new "promotions" plug-in enabling pro-rata payments. GST is also enabled. Members can enter all their relevant business details including the business name, category, address, logo, images, description, phone, mobile, email, website and also social networking links such as Facebook and Twitter etc. Only the fields that are completed are displayed in the business directory listings. Members can choose multiple categories for their business. If a subscription expires, the listing is automatically disabled in the directory until the member renews. "Member Stories" blog featuring stories from Chamber members. "Resources" implemented using the built-in Joomla weblinks feature. Events with various categories implemented using JEvents including "Upcoming Events" module. News with various categories implemented using the built-in Joomla category blog feature. Mailing list and newsletter features are implemented using AcyMailing including a customised template for the client. Comments are enabled on some of the article categories using JComments. Social networking "follow" and "share" features implemented using PGT SocialWeb and Social Media Icon Links. Easy Folder Listing has been installed to make it easy for administrators to upload minutes in the Members Only section. RokStories is used to rotate banner advertisements paid for by sponsors. The excellent CBJuice was used to help import the existing member data. The "Momentum" template from RocketTheme has been installed and customised with an appropriate background image, transparent main and module areas. The logo is another excellent job from C6 Media Solutions. Basic on-site SEO has been implemented using sh404SEF. ChronoForms has been configured so that the business directory listing for each business contains the business name in the url. Checking the score in the Nibbler test tool reveals a score of 8.2 which is excellent considering that little to no social networking has yet been done.